WASHINGTON — Airlines should clearly disclose the cost of change and cancellation fees, as well as the size of the plane’s seats, before a passenger buys a ticket, a federal panel said Tuesday. Hotels should also be required to include any mandatory fees in their room rates, the Transportation Department’s Advisory Committee for Aviation Consumer Protections recommended. Some hotels have begun adding mandatory resort and other fees to bills even though customers say they weren’t informed of them when they booked their rooms. The panel’s recommendation on hotels was directed to the Federal Trade Commission, which has been investigating such so called drip pricing. Likewise, the four-member panel heard testimony that passengers must search to find the cost of change or cancellation fees that airlines hide in a ticket’s fine print. The fees can run hundreds of dollars, especially on international flights. The Transportation Department should require the fees be spelled out clearly so that passengers are informed before a ticket purchase, the panel said. The panel also recommended that the Transportation Department permit airlines to choose whether to allow passengers to make wireless voice calls from planes during flights. Airlines have also shrunk the distance between a seat and the one in front by as much as 6 inches in recent years. It used to be that 34 inches between the seats was standard for economy class seats. But now 31 inches is typical and some airlines have wedged in so many seats that there is as little as 28 inches of room. The width of seats is typically 18 inches but has been reduced in some cases to 17 inches, and there are indications some airlines may shrink them even more, said Charlie Leocha, head of Travelers United, the consumer advocate on the panel. Seat shrinkage has raised concern that passengers may get blood clots if they sit for a long time without the ability to move around, and that passengers may not be able to quickly evacuate a plane in an emergency. The Federal Aviation Administration requires that aircraft makers demonstrate that all passengers on an airliner can be evacuated within 90 seconds with half the emergency exits blocked in order for the plane to be certified. There have been no evacuation tests of airliners with seats 28 inches apart, Leocha said. The panel recommended the FAA conduct more realistic evacuation tests, including of planes with seats as close as 28 inches apart. Leocha said he was disappointed the panel didn’t recommend the FAA issue regulations establishing a minimum amount of personal space that must be allotted per passenger. There are already regulations that set a minimum amount of space that pets on planes must be allotted, he noted. Panel member Dave Berg, an attorney with Airlines for America, a trade group for major airlines, said he objected to the notion that the government should establish a minimum amount of space per passenger. 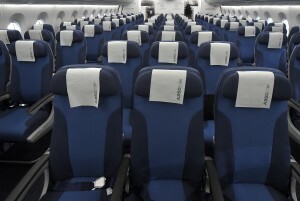 Difference between seat sizes “goes to the heart and soul” of airline competition, and it would be inappropriate for the government to interfere in such competition by a deregulated industry, he said. The FAA is not required to act on the recommendations. The airline passengers advocacy group FlyersRights has filed a petition asking the FAA to establish a minimum amount of personal space per passenger.